A robot under development at the University of Illinois automates the labor-intensive process of crop phenotyping, enabling scientists to scan crops and match genetic data with the highest-yielding plants. A semiautonomous robot may soon be roaming agricultural fields gathering and transmitting real-time data about the growth and development of crops, information that crop breeders – and eventually farmers – can use to identify the genetic traits in plants likely to produce the greatest yields. A team of scientists from the Carl R. Woese Institute for Genomic Biology at the University of Illinois is developing the robot in partnership with researchers from Cornell University and Signetron Inc. Inspired by the autonomous rovers used to search collapsed buildings and other dangerous environments, the agricultural robot is propelled on continuous tracks, or miniature tank treads, which enable it to navigate through dry or muddy fields. Researchers guide it using GPS and a laptop computer. Traveling between the crop rows, the robot uses hyperspectral, high-definition and thermal cameras, weather monitors and pulsed laser scanners to capture phenotypic information – such as the stem diameter, height and leaf area of each plant – and assess environmental conditions, such as the temperature and moisture content of the soil. The robot stores the data in its onboard computer and transmits it in real time to the grower’s computer. Scientists use the data to create a 3-D reconstruction of each plant, develop predictive models for the plant’s growth and development, and estimate the biomass yield for each plant and the entire plot. “Immediate access to the data is very important for crop breeders in the U.S.,” said U. of I. agricultural and biological engineering professor Girish Chowdhary. “It’s very important for them to see and visualize the data. If the data are available to the breeder quickly, then they can make actionable decisions” that enhance production. 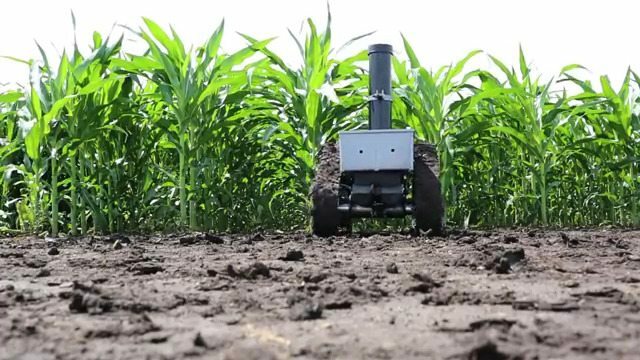 Although researchers are currently using the robot to assess fields of energy sorghum, a crop used in biofuel production, they say the robot would perform equally well with other tall-growing row crops such as corn and wheat, and possibly with soybeans before the plant canopy closes. The robot is a “game changer” for both crop scientists and farmers, automating the labor-intensive phenotyping processes of farming and crop development, said Stephen P. Long, the director of the project. Long is the Gutgsell Endowed University Professor of Crop Sciences and Plant Biology at Illinois. 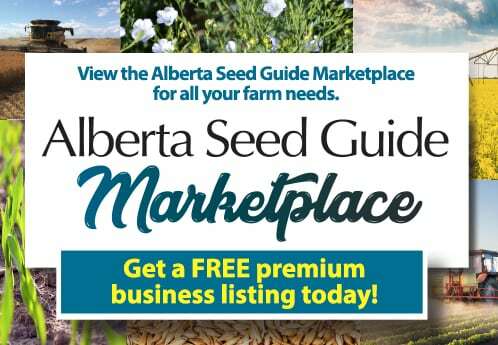 “For producers, it’s going to accelerate the rate at which we can improve the genetic material. We can now select material much more rapidly and select many more plants as well, so we can eventually deliver to the farmer a far more productive bioenergy crop,” Long said. “One of the big advances of the last few years is that we can now determine the complete DNA blueprint of each plant. But how do we use that? What we need is to be able to describe a plant as it grows. You could do that perhaps with an army of people, but now the robot can do all of that for you. 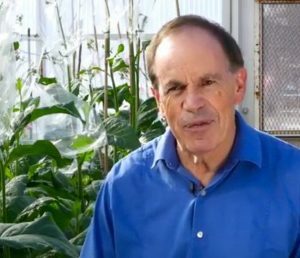 We can combine the phenotypic information about how the plant’s performing with the genetic blueprint and identify the combination of genes we need to get the best plant possible,” Long said. 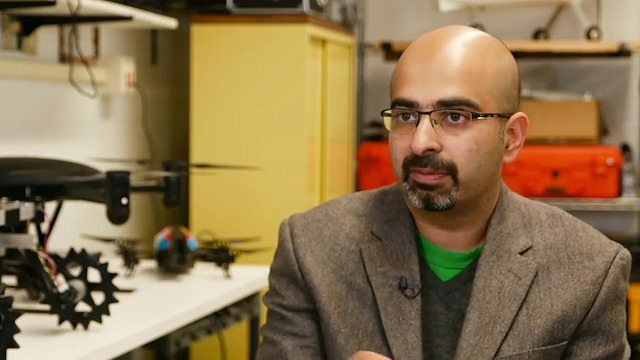 Chowdhary, whose research focus is field robotics, is modifying the robot’s current design to reduce its width so it can maneuver more easily between crop rows. He also plans to install a sensor system for detecting and avoiding obstacles. To reduce the production costs associated with the robot’s current metal and track construction, Chowdhary’s team is exploring the feasibility of producing some of the components via 3-D printing. Unlike the robots used in factories, agricultural robots must be weather resistant, Chowdary said. The underlying technologies – the algorithms, the mechanical design and the human-robot interaction devices that provide robustness – are useful in many other industries, including defense, surveillance and scientific exploration. The team expects to have a prototype built within two years and begin manufacturing thereafter, with the goal of having the robot on the market by 2021.